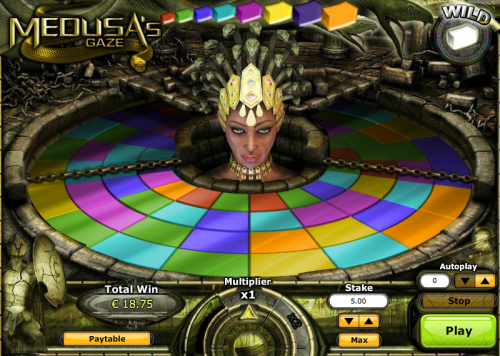 Medusa’s Gaze is one of a number of online slot machines which use Greek Mythology as their theme; that era produced many compelling tales which translate well to slots which use characters and bonus games to enhance the user experience. This Playtech offering is actually a little different in that it’s an arcade slot which contains some of the features of a standard slot but it has it’s own idiosyncrasies as well. Medusa was the snake-haired Gorgon monster who turned to stone anyone who looked directly into her eyes and that ability is the basis of this slot. Medusa’s Gaze is a impressive looking game and rather than symbols and reels there is a large coloured disc in the centre of the screen composed of four concentric circles. Medusa’s head is visible in the centre of the disc in all her snake-adorned glory; outside the disc are various pillars and stone heroes to give the impression of entering Medusa’s lair. There are eight different coloured blocks and a white ‘wild’ block. It’s a simple game containing just twelve paylines and when the player presses the ‘play’ button the disc spins in an anti-clockwise direction; the segment in front of you is highlighted and delineated by two chains and it’s in this area where the paylines are active. When you land one or more winning combos Medusa will crank up her gaze and turn those paylines to stone; those affected will drop out of the disc and more coloured blocks will swing in from the right and left to fill the gaps. This is the point at which more winning combos can be formed. In addition to this potentially infinite combo maker, there is a multiplier which increases by one every time new combos are formed. In our experience it’s quite possible to reach the fourth level of winning combos with a lucrative 4x multiplier to keep you company. The paylines are fixed so the stakes are simple; £0.20 to an impressive £500.00 per spin and there’s also a handy Autoplay feature.